Customer journey mapping is now the buzziest of buzz words. Every self-respecting marketing automation system offers something called a “customer journey map,” even if it’s exactly the same as last year’s campaign designer or does nothing more than connect functionless icons on a virtual whiteboard. Journey mapping is equally popular among agencies and consultants, although it also often is little more than a new label for the old sales funnel. None of this affects me personally, but if I were a real customer experience expert I'd be annoyed at cartoon versions being presented as the real thing. Sophisticated journey mapping has been around for more than a decade*. It involves not just listing interactions or displaying them in a diagram, but also analyzing their contents, results, and supporting systems. Most customer experience teams have struggled to do this with spreadsheets, graphics programs, or generic flow charts. I’ve done it that way myself and, trust me, it’s painful. suitecx is to static customer journey diagrams as Google Maps is to the Rand McNally Road Atlas: an interactive alternative with almost boundless functionality. Built by a team of customer experience veterans at the east bay group,** it’s clearly the system its designers always wanted but could never find elsewhere. The resulting sophistication makes it a bit scary at times, with more data crammed onto some screens than casual users can digest. But it also means the system is hugely flexible and will make serious users vastly more productive. 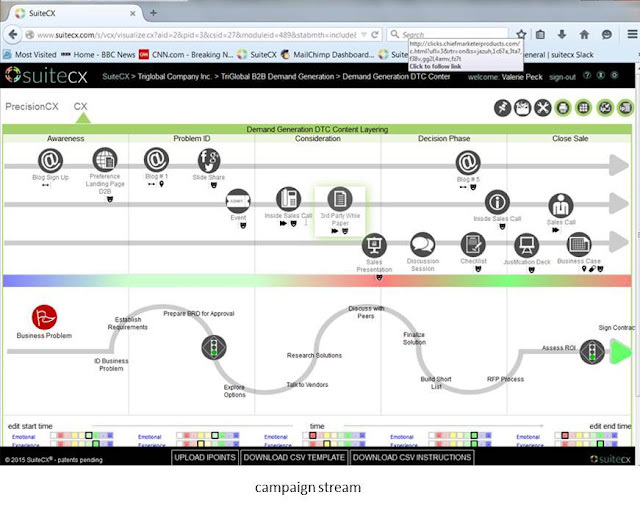 Customer journey mapping is just one feature within suitecx, which is sold as three modules: diagnosticcx to gather and organize customer experience information; visualizecx to display maps, findings, and recommendations; and precisioncx, which defines contact strategies and campaign flows. The tool is designed around its own intended user journey. This would start in diagnosticcx, which collects information about a company’s business, customers, and processes using customer and employee surveys, interviews, and direct experience. The findings are organized into a list of customer interactions, which are classified by journey stage, channel, department, emotional outcome, segment, and other properties. The interactions are then linked to recommendations, which are themselves classified, prioritized on four dimensions (customer impact, company impact, cost, and feasibility), mapped onto a matrix, set on a timeline, and ultimately converted into detailed project plans. visualcx supports the project by displaying the data in formats including story maps, process flows, interaction grids, a virtual wall with virtual sticky notes, and various summaries. The grids are automatically generated from the interaction list developed in diagosticcx or imported via spreadsheet. Grids can be filtered on different interaction attributes and users can drill into individual interactions to see the underlying details. The story maps and process flows are built manually, alas, but still use the same drillable interactions. 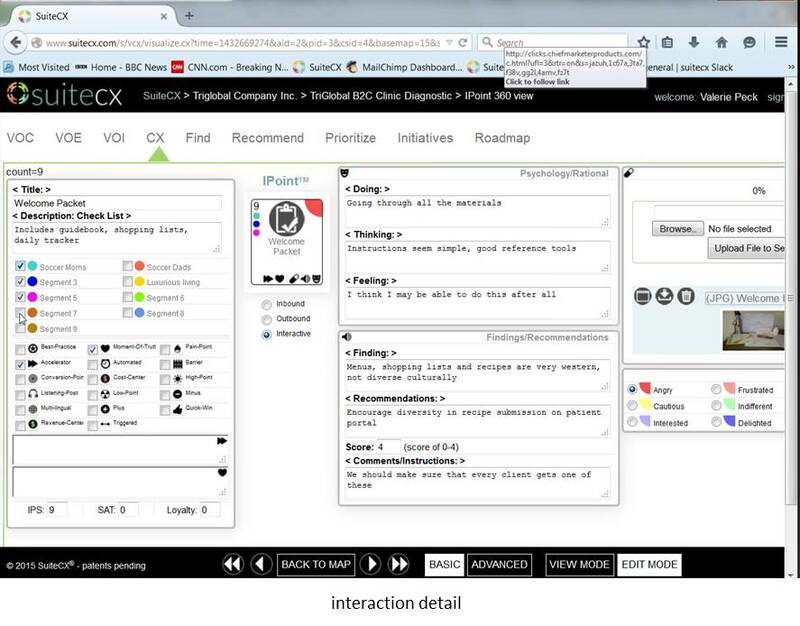 precisioncx completes the project by letting users design new customer experiences. These include over-all contact strategy and multi-step campaigns with segments, creative, triggers, metrics, and other attributes for each step. The system can’t execute the campaigns but an API is available that could export the campaign designs to execution systems. This is all industrial-strength stuff, aimed at corporate customer experience departments, agencies, and consultants. Pricing is similarly industrial, starting at $15,000 per module for up to three users. suitecx also offers single-function “primer” products for a much more affordable $699 each (and a seven day free trial). 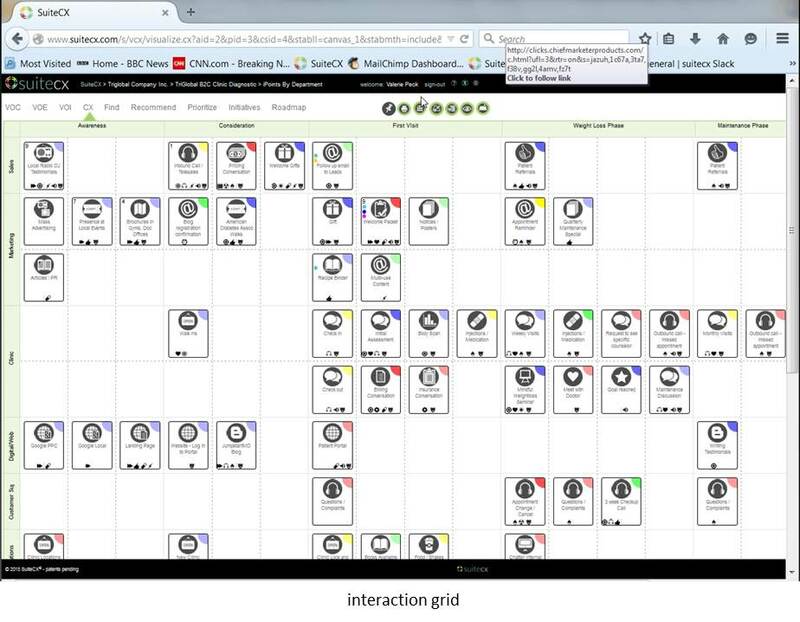 Current modules include grid diagrams, story flows, and the virtual wall with sticky notes. 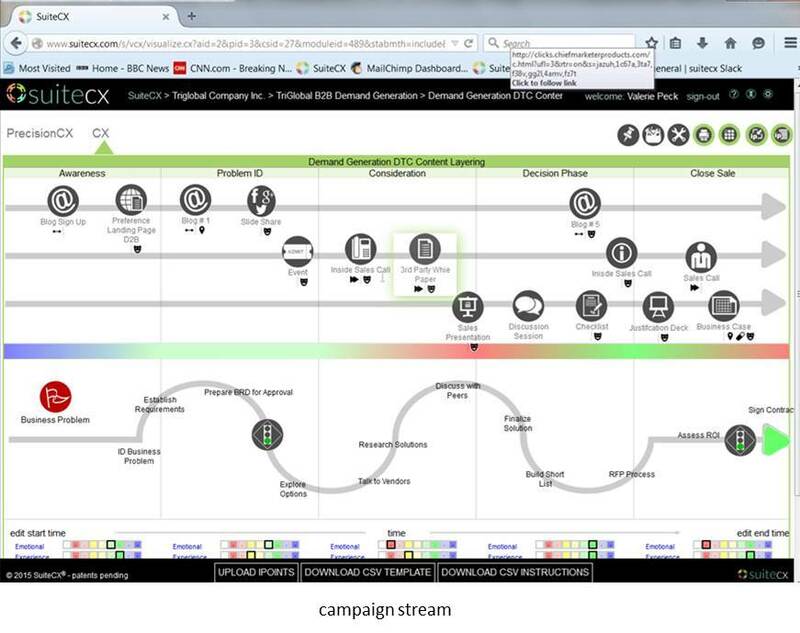 Process maps and campaign flows are under development. Early versions of suitecx have been used by the east bay group in their own work for years. The commercial product was formally released in December 2014 and currently has about 20 paid clients for the major modules. * the earliest reference I could find on Google was in a business school course syllabus from 2001. Apparently the term had already been around long enough by then to be picked up in academia. ** which seems to have an issue with capital letters. Excellent review. I agree that journey mapping is buzzing at high decibel levels. I refer to this process as 'heavy lifting' for companies because it's complex and requires deep and broad reviews of what's working and what needs to improve. I'm always interested in tools that can help with this process. suitecx looks very interesting. The modules that gather data and define workflows seem powerful based on your review. The capability you describe is very extensive. However, I can't see how to derive $15K in value from such a platform. Sure, some F200 enterprises will easily drop this to arm a marketing analyst whom supports a CMO. This platform reminds me when I sold CASE software development tools in the early 90's during the 'client-server project' days. Massively expensive tools could do everything from gathering requirements, analysis, design, coding and testing. The problem was those tools were cumbersome and often rigidly constrained to a vendor's definition of a methodology. One challenge I see with suitecx, in my opinion, is the complexity and (seeming) lack of integrations with base platforms like marketing automation. I like how this platform does seem to focus on the customer experience instead of a tactical engagement channel. However, with the trouble that many orgs have in utilizing martech in general, how well will something like this be adopted, especially at that price? Seems like a capability that should be rolled into an Oracle MC, Salesforce MS, etc. Hi Brian. I think you're understanding this correctly. 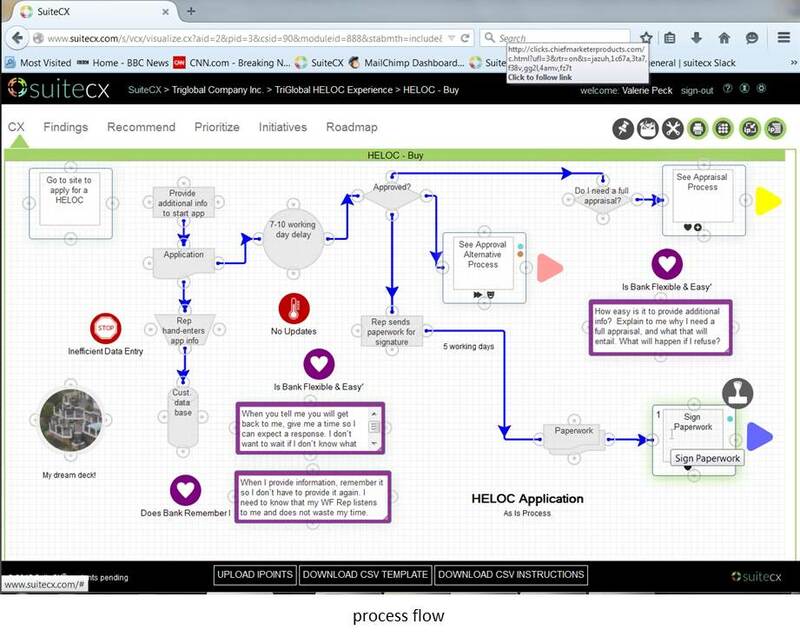 Suitecx is definitely a tool for expert users and is built to support the flow of a CX consulting project. It would be great if campaigns designed in the system could be automatically executed in a marketing automation or campaign management tool. That's not available yet although the developers are working on it. I'd also like the system to import interactions automatically so you could easily see how volumes and flows have changed over time: as I understand it, the closest suitecx comes right now is to import a list of interactions with the volumes attached, and even then the system wouldn't automatically generate the flow charts, highlight changes or identify problem areas. I do agree that serious journey mapping should be part of marketing automation tools like Oracle, Adobe and Salesforce. They would come at it "backwards" from the execution end, while suitecx comes at it "frontwards" from the interaction analysis. It's that initial analysis where suitecx really has its value, and that's missing entirely from the marketing automtion products. So they are really more complementary than competitive, and probably what you want most is an easy data interchange so the analysis tool can grab actual data to understand flows and the execution tool can grab the redesigned journey flows. In other words, they don't necessariy need to be part of the same system but should integrate. As to pricing: the sutiecx people tell me that some smaller firms have paid the full fee. If you think about, it's not hard to justify $15,000 in terms of time savings: at $150 per hour, it's just 100 hours per year (2 per week!) across a three person. The true value should be much higher, since it comes from finding improvements in customer treatments and getting those accepted because they are properly documented and presented. Still, I'd expect that big enterprises, agencies, and consultants would be the primary buyers. Check out our $699 Primer Product. Its MUCH simpler and would be of interest for the less than power user. We also have a restfulAPI and are working with a number of vendors to visualize heat maps and tie to marketing automation tools. suitecx.com has a free 7 day trial should you want to check out one of those products.